Combine 4 popular attractions and SAVE! Experience some of Phillip Island's best attractions with this '5 Park Pass'. Providing you with entry to the region's most popular sites within the Phillip Island Nature Park including the Penguin Parade, Koala Conservation Centre, Churchill Island Heritage Farm, the Antarctic Journey and a Wild Ocean Eco Boat tour. A great outing for all ages, Phillip Island Nature Park is a great way to get up close to local wildlife and learn all about the region including its heritage and furry residents. Penguin Parade will get you up close to large groups of Little Penguins as they make their way from the water to the beach to rest for the evening. Koala Conservation Centre will let you see these adorable Aussie favourites in their natural environment away from the cages and enclosures. Churchill Island Heritage Farm offers guests the chance to step back in time and learn about the old ways of the region with various farm activities and sheep shearing as well as letting you get up close to a range of animals including wallabies. This pass will also give you entry in the Antarctic Journey, which is a family-friendly, hands-on interactive exhibit letting you experience an Antarctic Journey at the Nobbies via multimedia displays and virtual experiences. Lastly on the Optional Eco Boat Tour you can discover the rugged coastline of Philip Island's southern coast between Nobbies and Penguin Parade. Catch migrating humpback whales between the months of June and September, see groups of little penguins out for a fish, and check out the fur seals in the largest fur seal colony in the world, before passing the historical Summerland Peninsula. Phillip Island is reached within a short 90 minute trip from Melbourne and offers visitors an enjoyable, wildlife-loving day out of the city. Combining all of these attractions into one affordable pass will let you save money while enjoying yourself on your next Victorian holiday. This Phillip Island 4 park pass provides a unique educational experience for everyone to enjoy - so grab yours online today! Martina Paulic 3 months ago “ What a wonderful family getaway! We all young and older enjoyed the beautiful nature and the cute animals. The Penguin Parade was great... it was so fascinating seeing these cute little animals waddling along and also seeing them so close afterwards along the boardwalk. The Koala reserve was great as well being up so close to the fuzzy cute koalas. Churchill farm was also a great experience as was The Arctic Journey and the walk along the beautiful path. Great fun and will definitely be back! What a wonderful family getaway! We all young and older enjoyed the beautiful nature and the cute animals. The Penguin Parade was great... it was so fascinating seeing these cute little animals waddling along and also seeing them so close afterwards along the boardwalk. The Koala reserve was great as well being up so close to the fuzzy cute koalas. Churchill farm was also a great experience as was The Arctic Journey and the walk along the beautiful path. Great fun and will definitely be back! It was the best ever trip from Melbourne! We extremely enjoyed the beautiful view of Phillip Island and also cute penguins! We felt we are in another world. Totally different from other places where we can go from Melbourne. I highly recommend using this ticket for the trip. Easy to change to real tickets and get in every park! Lots of fun there. Don’t miss it! We took the Phillip Island 4 excursion pass with the optional eco boat tour. The day was perfect. Bright and shiny. We loved the penguin parade and the koala site. The staff was friendly and welcoming. We enjoyed every bit of our tour and this pass is value for money. The Penguin Parade was the highlight of our trip. Amazing. Loved it. Kids had so much fun. The Koala Conservation Centre was a close second followed by the Antarctic Journey. We had a lovely walk around the cliff and saw some baby penguins in their houses. The Churchill farm was a bit disappointing. Glad I didn’t have to pay the full entry fee for that. Had an amazing experience on Philip Island. 4 Park Nature pass was the best cost effective pass for the entire tour. Loved the scenarios when the penguins came back to their home with a huge pack in a parade. What a lovely moment to welcome these penguins when they come back to their home. Koala Park and the Farm was an epic trip as well. My kid enjoyed a lot when milking the cow on the farm. And Antartic Nobis centre was a great place for the kids to play around while waiting for the penguin parade. Thanks for the Experience Oz for making the whole trip smooth and cost-effective. Phillip Island has a lot of attractions that any visitor, domestic or international, would love to experience. Having the opportunity to visit places such as the koala sanctuary as well as the penguin parade was amazing. On top of this, the 4 attraction deal made the whole experience even better. We were able to see what we wanted while visiting the island while saving money. It's was so worth it! I purchased via Experience Oz! You can enjoy another 5% discount if purchase via Experience Oz and it's simple and easy! Philip Island 4 Park Nature pass is suitable for those who want to spend 8-10 hours at Philip Island. My children's really enjoyed their time at Philip Island. The 4 Park Pass offered great value for our family. The kids 4 and 5 years old had a great time as did us adults. We all really enjoyed the beautiful scenery and nature surrounding us but everyone's favourite part was being so close to the animals. We got a great deal on this site and would highly recommend the company and the experiences they offer. We look forward to more adventures! Thank you! This 4 park nature pass was very easy to use and we enjoyed the whole of Phillip Island well in a much relaxed two days pace. The Penguin Parade is the highlight and the little cute penguins were wonderful to see close up. Churchill Island is a beauty surrounded by sea. Koalas conservation showed some Koalas in close up. Though I did not enjoy much in Nobbes Centre Antarctic walk, the overall experience in Phillip Island was very good. Thanks to Experience Oz for giving 50% discount to Melbourne Star Observation wheel on purchasing this pass. Great experience, the 4 Park pass let us go around the island and visit the main highlights of the place. We stayed there for one night, so the first night we went to the Penguin Parade just after the sunset, and enjoyed watching the gorgeous penguins. The next day we went to the Antarctic Journey first thing in the morning (good activities for kids) and then to the koala conversation place (which was a bit boring) because you often see more Koalas on the road for free. Lastly the Churchill Farm, where we enjoyed watching the animals (great for kids). It is good for once off visit. 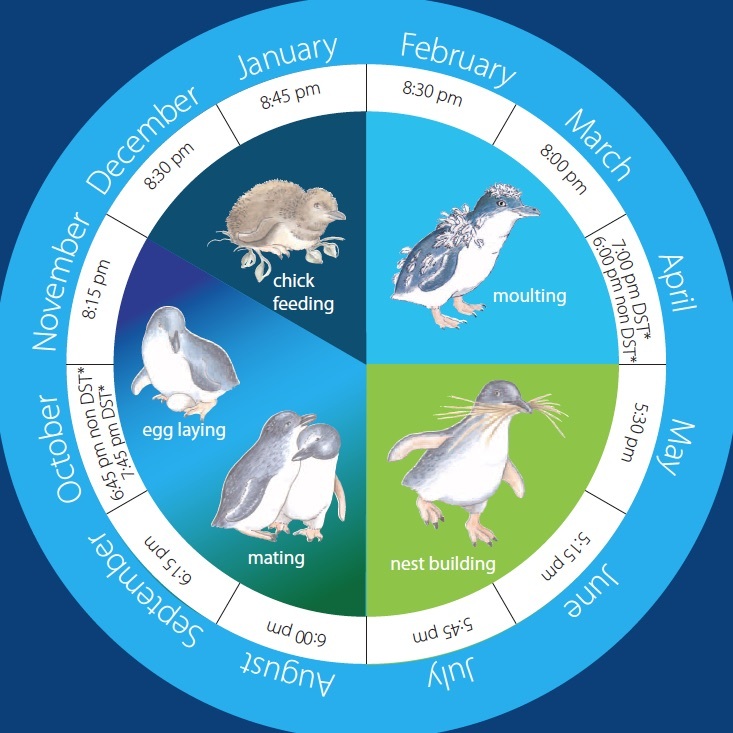 At Phillip Island you can see the world’s smallest (and cutest) penguins in the wild, take a virtual journey to Antarctica at the Nobbies, see koalas from treetop boardwalks and take a step back in time at a heritage farm!.